By choosing to stay with Naomi, Ruth was giving up her chance to remarry and have a family again. She was also giving up her homeland and everything familiar. It was a difficult choice to make, but Ruth put her faith and her hope in God and followed Naomi. In the end Ruth’s hope for a husband is fulfilled when she marries Boaz. Learning Aim: Hope in God. Before class put candy in a brown paper bag. The children will tell you what they hope is in the bag but they won’t be allowed to see what it really is until you let them. Say, I have something for you in this paper bag. But I’m not going to let you see what it is until after we tell our Bible story. What do you hope that it is? Hope is the feeling that you get when you are waiting to see what’s in the back. You have hope that there is something good in this bag. When Ruth went with Naomi she put her hope in God. As a result God blessed her with a husband, Boaz. Open your Bible to Ruth 2-4. Say, Whenever Ruth went with Naomi to Bethlehem her situation was hopeless. Her husband had died and there was no hope of her ever finding another husband if she went with Naomi. However, Ruth trusted God and put her hope in God. Whenever Ruth and Naomi reached Bethlehem Naomi sent Ruth out into a field that was owned by Boaz to collected wheat that the harvesters left behind. Boaz made sure that there was something left for Ruth to pick up. Without the left over wheat Ruth and Naomi may have starved. Boaz knew that Ruth had given up a lot to help Naomi and he that she it was great that she trusted God. Naomi told Ruth to be kind to Boaz and Boaz decided to marry Ruth! Ruth put her hope in God in a difficult situation and as a result she married Boaz! Cut one paper plate in half and glue or staple the curved edges together to make a basket for each child. Let the class decorate their baskets. Make a handle for the basket from a strip of paper. Let each child fill their basket with yellow pipe cleaners (wheat). Say, Ruth trusted God and went out to collect wheat to for herself and Naomi. Ruth put her hope in God in a difficult situation. Give the kids some time to play and act out the story. Provide the following items for their play: the baskets and wheat they just made, Travel accessories such as a map, and a suitcase, and Wedding accessories such as flowers and a veil. Let the kids free play as long as they are engaged and behaving. Say, Here are a few of the things that Ruth and Naomi may have needed during this story. You can use these things to pretend that you are in the story. You can act like you are Ruth collecting wheat, that you and Naomi are traveling to Bethlehem, or that Ruth and Boaz are getting married. Let’s see how much of the story that you can remember while you play! Spread the wheat (yellow pipe cleaners) across the floor. On the other side of the room place a large box or basket. The children must pick up one piece of wheat at a time and then run and put it in the basket. The teacher will count to 10 as they scramble to get all the wheat picked up before the teacher reaches 10. The hard part is that they can only pick up one piece of wheat at a time. Say, I hope that you are able to pick up all the wheat before I say 10. Sometimes people let us down, but when we put our hope in God he never lets us down. Write HOPE IN GOD on a piece of construction paper. Let the kids cover the letters with stickers or with yellow crayon. Say, I am so proud of how you traced these letters! This paper says Hope in God. Always remember to put your hope in God! Say, Now that we are down with our lesson let’s see what is in the brown paper bag. After waiting all morning I am sure that you are hoping that that something good is in here! Let’s always remember that we can put our Hope in God and that He will never let us down. 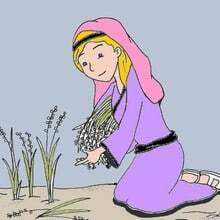 Don’t miss our Book of Ruth Bible coloring page and another Bible Lesson about Ruth. Tony Kummer (Editor) reviewed & updated this page on : June 1, 2016 at 11:36 pm. All our content is peer reviewed by our readers, simply leave a comment on any post suggest an update.